Derek: Would you still love me if I wasn't a surgeon? Meredith: No. No... Because Izzie has skin cancer that's spread to her brain. And you're one of about 20 people in the world who can save her. And I don't know if I could respect somebody who could walk away from a gift like that. So please don't. Here are her scans. It's pretty bad. Cristina: Sometimes we fail, but that's not always the case. 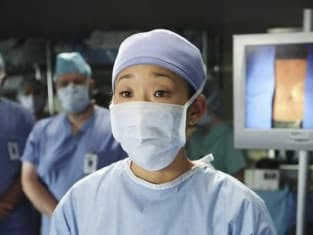 Cristina: I told Alex, and Bailey, and they're telling Meredith and George. Cristina: No, I couldn't do my job. I think you came to me for help, and that's what I did. Because sometimes we win Izzie, and I want you to fight. Ok. You know, for whatever that's worth. I want you to fight. Izzie has stage 4 metastatic melanoma that has spread to her brain, liver and skin. She may only have months to live, and she's resisting treatment. She needs help. George: This is year one of your residency. You turn on each other now, you're not gonna make it. Meredith: Okay, here's what's gonna happen. All of you are going to go and find the sense that the good lord gave you, and never behave like this within the four walls of this hospital ever again. You are doctors. Pierce, get an ice pack, and put it on that oozing, disgusting, mess of an eye. And Steve, go to the pit, and get that unsanitary, bloody hand x-rayed and stitched. And Megan, you should go to OB, because yes, you are pregnant. George: That was very Bailey. Derek: GET OUT! RICHARD! GET OUT! Richard: Look, I've destroyed lives before. Several in fact, and yours is not one of them. Now, I sent the woman you love out here to help you. I sent the woman who loves you, out here, to bring you back to your life. If you ruin it with her, that's on you. I don't accept it. You're scared, you're drunk. You don't know which way is up. You threw a punch at your best friend, and you threw a ring at Meredith, and now you wanna throw me out. I'm not accepting it. Because, I'm older than you, and I've been where you are. You've been drunk for a few day, I was drunk for years. And I know you're gonna need at least one friend when you decide to come out of that hole you're digging. I hope you come out of it soon, and I'll be here when you do. Derek: I don't think I can get her back. Richard: Did you call her? Derek: What am I gonna say? Richard: I had an affair for years. When Adele found out, somehow she took me back. You can make your way back from anything. Richard: What the hell is this? Oh this is not ok, I have a hospital to run. And Derek, what the hells the matter with you man? We've all been there. Richard: We've all had tough losses. Richard: We show up the next day, and we try and save the next life. Callie: Yeah we covered that too. Richard: Ok, what about this? Nothing we do can stop death. We can hold it at bay every now and then, but everyone dies. And that's not on us. Derek: I took a pregnant woman in for a simple surgery, and I botched it. That is on me. I should feel badly about that. And you, you should feel badly that while I was out here, you sent Meredith out here expecting a ring. Why would you do that? Why in gods name, would you do that? Richard: I was trying to help. She didn't wanna come. She wanted to leave you out here alone, I was trying to help Derek. Derek: You were trying to help yourself. Not me. Yourself! I hit the ring in the woods. In the woods. You destroyed me. George: Hey buddy, you need to start talking, and you need to start talking now. Intern: I really can't, talk to Steve. George: Is gonna have her very first solo surgery, and so we have very little patience right now. Intern: Look, it's not my place. Meredith: Ok, you are gonna tell me everything thats going on. Or else, every time I have a rectal exam or an infected abscess is gonna have your name on it. Every time! Miranda: Do I look like therapist? Miranda: I've lost Hunt and Torres. See, I sent them to get Shepherd and I never heard from them again. See, I was trying to solve the Shepherd situation for you, Sir, but, It appears I've somehow made it 3 times worse. So, I'm telling you and my next move I believe is that I'm gonna call the police. Because, I'm half convinced they're all dead, on a spit, with a one armed man turning them into shish kebabs. Sir. It's my mind. It just goes there. Izzie: I'm not gonna be a piece of meat in this hospital while you all fight over who gets to slice me up and then laugh while you do it. Izzie: I'm not telling anybody, so just drop it. Cristina: No. You're not dumping this on me. You're not dying in my arms. So either you tell them, or I will. Izzie: I don't even know if I want treatment Cristina. I know too much. I know how violent surgery can be. They're gonna cut into my brain, they're gonna slice open my abdomen, and pull my organs out. And for what? Surgery fails all the time. Derek Shepherd is in the freakin woods right now, because we fail all the time! And even if they do everything right, I have a 5% chance of survival. 5%. Why would I put myself through hell? Run poison through my veins, irradiate my brain, if it's not gonna work anyway? Cristina: Why did you tell me then? If you don't want my help, and you're not gonna do anything about it... why did you tell me? Izzie: Just keep your mouth shut, and forget I ever told you anything. Cristina: You blew it off? Cristina: I called every favor I had in this hospital, and then some. Swindler's is the best Oncological surgeon in the state. Why didn't you go? Izzie: Why do you care so much? Izzie: They were calling the guy blow hole Cristina. Not just the interns, Alex. What are they gonna call me when I'm the patient? Swiss cheese for brains? Cristina: No, that's awkward and long. Blow hole's pithy. Owen: What I... what my point was, I kept, you know I... I went back. I showed up. I showed up for work, you know. Derek: You get dead inside. You get dead inside because if you actually felt it. If you let yourself feel that. No way you're going back. No way. Owen: I was a second year resident, NBC rolls in. Parents were in the front seat. Three kids in the back. Kids were okay, Mom and Dad were a little banged up but nothing terrible. They were talking, laughing in the ER. Turns out both parents had massive internal injuries. I operated on them both that night, hours. I lost them both. Now if I'd moved faster, if I'd rushed them to CT. If I'd known how bad off they were sooner... but I didn't. The eldest kid was 9. When I came out to tell them about their Dad, he was trying to console the 3 year old and the 5 year old about their Mother. I'll never get that image out of my head. This, this 9 year old boy trying to hold these two little ones. His arms just not big enough. I don't know how I came back the next day. I think part of me never did. Derek: I'm surprised you didn't talk about Iraq. Owen: I don't talk about Iraq.